Is the selling over or the real CRASH begins? Looking for a bounce and then the behavior of the market at the SPX 2912/16 zone, if it gets there. I am becoming more convinced that the key factor that will affect the market during the next few weeks will not be found in the US BUT WILL BE GEOPOLITICAL. Just one of those potentially inconsequential hunches, but on rare occasions a few turn out to be quite visionary! What is left in the domestic economic, financial, and political environment that can affect the market? VIX closes in the 16-18 range have proven on several occasions to be key during this two year uptrend in the S&P 500. If the SPX fails to hold onto support near 2870, I'd look for the VIX to help mark a significant bottom by jumping into that 16-18 range on a closing basis, with a possible intraday spike higher than 18. 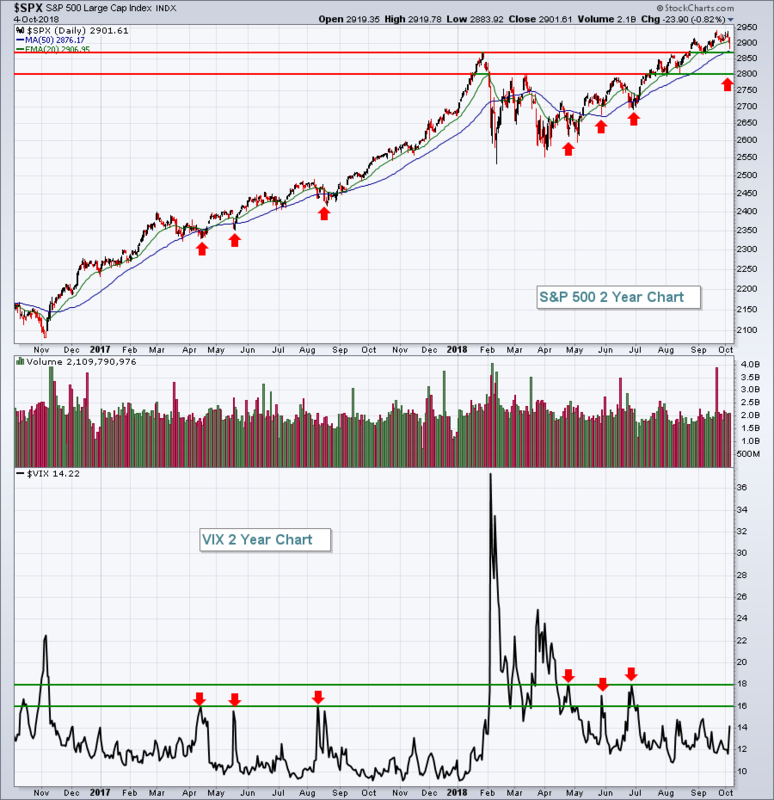 That spike could accompany an SPX price support test close to 2800, if selling accelerates. Before heading off on my vacation, I mentioned the breadth indicators for the major exchanges were getting weak, but the breadth for the $SPX was still very bullish. This week the main exchanges saw the breadth crash to twenty-four month lows. The Bullish percent index for the NASDAQ is now below 50% but more importantly it has declining tops since the beginning of the year. Notice the series of lower highs on the BPI compared to the higher highs on the $COMPQ. This divergence is huge and meaningful. It is very important that the market bounce from here. Notice at the other major tops marked by blue vertical lines, how the declining highs in the Bullish percent Index occurred before the market broke down. The Percentage of stocks above the 200 DMA in the bottom panel is only at 42% shown in black. THat means that on Friday's close, over 57% of the stocks were under the 200 day moving average! These are not levels to expect new highs from. This also looks like a failed test of the August high on the $COMPQ. It was a brutal week for many areas of the stock market, but mostly those areas that have led the charge for so long. Stocks that for one to two years or more rarely saw a significant pullback suddenly couldn't find buyers this week. Unfortunately, that's how Wall Street works. Ever notice how quickly the market sells and how long it takes to recover. As I finish my weekend reading, I can't help but be puzzled by so many who are saying "stocks took a battering" ! This from BARRON'S, long, posted the full article for those interested and may not have access. Who said Octobers in midterm years were good for the stock market? Just one week into the new month, stocks were defying the history cited here recently, slumping sharply in the final two sessions of the week. Bonds took the blame for stocks’ slump, as longer-term Treasury yields rose above their previous 2018 peaks to their highest levels in seven years, pressuring equities’ valuations. Strong U.S. economic data underpinned expectations for continued Federal Reserve interest-rate increases. While interest rates garnered most of the market coverage, it wasn’t the only story behind the retreat in stocks. JPMorgan ’s cross-asset strategy team called Fed policy mere “ambient noise” compared with what it saw as the bigger factors: Italy, oil, and, especially, China. Italian bond yields moved up again as that nation’s anti-establishment government announced a budget with a deficit of 2.4% of gross domestic product for 2019. Even though the deficit projections for future years were trimmed, the standoff with the European Union continues. Oil prices also continue to move up, with Brent crude hitting a 2018 high above $86 a barrel at midweek. JPMorgan sees the price of this international benchmark heading toward $90, with Russia and the Organization of the Petroleum Exporting Countries not making up for supply shortfalls. “The U.S. probably could not have chosen a worse time to sanction Iran,” with the oil market already in deficit by 500,000 to a million barrels a day, the bank’s strategists write. China, however, raises the greatest risks. As our colleague Matt Klein writes, China has turned more belligerent, most shockingly in the alleged planting of tiny spy chips on computer motherboards, as reported by Bloomberg Businessweek. The tensions between Washington and Beijing also were evident in the near-collision between a U.S. Navy destroyer and a Chinese warship making aggressive maneuvers. Vice President Mike Pence last week delivered a sharp speech on China, saying that the U.S. “will not stand down” from what he charged were, among other things, China’s interference in U.S. domestic politics. In the economic sphere, JPMorgan’s base case for 2019 is for a full-scale trade war, with 25% U.S. tariffs imposed on all Chinese goods. China, the bank continues, is apt to respond with fiscal and monetary stimulus to cushion the tariffs’ blow to its economy, while depreciating the yuan further to regain export competitiveness. The tariffs raise “questions for the world’s most-expensive equity market (the U.S.) and one of its cheapest (China),” the bank’s strategists continue. They estimate that 25% levies on all Chinese imports to the U.S. would trim earnings for the S&P 500 by $8 a share, from their original projection of $179 for 2019. “Such a downgrade would mark the first of the Trump era and potentially end the U.S. stock market rally, even assuming a forward [price/earnings] multiple of 17, unless some other offset materializes,” they conclude. On a micro level, CNBC reported Friday that Greenlight Capital had sold its remaining shares of Apple (ticker: AAPL) on Aug. 31, in part because of worries “about Chinese retaliation against America’s trade policies.” The hedge fund also said it had earned a $1 billion profit on its Apple position, according to a letter to clients. It’s also no coincidence that the tech-heavy Nasdaq was the biggest loser last week, dropping 3.2%. Now that longer-term U.S. Treasury yields have broken out to their highest levels since 2011, the key question for investors is whether the rise will mainly affect just the financial markets, or will hit the real economy as well. The contradiction between interest rates that, prior to the financial crisis, had been this low only in recessions, and an economic expansion that is well into its 10th year was evident in the sharp selloff in long Treasuries last week. Yields on the benchmark 10-year note and the 30-year long bond broke out above their respective previous 2018 highs of 3.12% and 3.25%, the latter level being the trip wire warned about by Jeffrey Gundlach, the chief investor of DoubleLine Capital and a member of the Barron’s Roundtable. On Friday, those yields reached 3.230% and 3.405%. Bulls on the global economy called such yields reflective of robust growth. Peering at his charts, Evercore ISI technical guru Richard Ross sees parallels between the breakouts in bonds and other “Bs”—Brent crude and Boeing shares (BA)—both indicators of a strong global economy. But another factor is weighing on the U.S. bond market. The high cost of hedging currency risk is damping foreign demand for securities denominated in dollars. That cost is elevated by the Fed’s short-term rate increases, which have put U.S. money rates far above their counterparts elsewhere in the world After taking this into account, the yield pickup in U.S. securities disappears for investors abroad. Those Fed hikes, of course, reflect the monetary authorities’ desire to normalize rates, with unemployment at 3.7% and inflation running at their annual 2% goal. Another goal of normalization is to reduce the size of the central bank’s balance sheet, which had quintupled from its pre-crisis 2008 level before quantitative tightening began a year ago. Since then, the Fed’s securities holdings have declined by $240 billion, and now are being cut by $50 billion a month. At the same time, the quantitative easings by the European Central Bank and the Bank of Japan are being throttled back. As a result, the rise in bond yields has gone global. As ever, Ed Hyman, Evercore ISI’s boss, sees a bright side in the backup in bond yields. Stocks will “weaken a touch,” which should tamp down “animal spirits” that might get too feisty, he contends. That, in turn, will stave off an overheating in the economy in a virtuous, self-correcting process. Readers will recall that Hyman, Wall Street’s almost perennially top-rated economist, insisted last year that the economy was booming in America’s smaller cities, contrary to the downbeat assessments of coastal elites. Strong economic readings—notably the larger-than-expected 230,000 September jump in private payrolls tracked by ADP and the Institute for Supply Management’s nonmanufacturing index’s highest numbers since 2011—have pushed up Treasury yields, writes Michael Darda, chief economist and strategist for MKM Partners. Those yields will certainly pressure equity valuations. The S&P’s current price/earnings multiple of 17 times forecast earnings is considerably above the 13 P/E in 2011, when yields last were at these levels. Viewed globally, America’s stock market is an outlier—a rare winner among asset classes, especially when the impact of the stronger greenback is taken into consideration. As is typically the case when monetary policy tightens, its impact is felt initially at the fringes, observes Christopher Wood of CLSA, who pens the Greed & Fear newsletter. Cryptocurrencies were the first victim, followed by emerging markets. U.S. stocks are the last man standing, he writes. Others see lofty interest rates hindering the real economy. “This yield back-up will bite,” declares David Rosenberg, chief economist and strategist for Gluskin Sheff. “One could be forgiven for wondering aloud about how rising interest rates in the most leveraged economy of all time, with over half the $6 trillion investment-grade corporate bond market now rated BBB (and a tsunami of refinancing due in the next three years), will play out from a default perspective,” he writes. That’s been a question keenly examined here and in other quarters. As for refinancing maturing debt, investment-grade issuers will have to pay higher coupons for the first time since the financial crisis. The most acutely interest-sensitive economic sectors, housing and auto sales, already are slowing. The lugubrious news on housing, discussed here last week, is reflected in the 19% decline this year in the iShares U.S. Home Construction exchange-traded fund (ITB). General Motors (GM) and Ford Motor (F) both trade around their 52-week lows in a market that set all-time highs just days ago. Those who hope the tragedy of Hurricane Florence will provide a fillip to auto sales are apt to be disappointed, according to Danielle DiMartino Booth. Florence may have flooded 20,000 to 40,000 vehicles, just a tiny fraction of the 600,000 destroyed last year by Hurricane Harvey, she writes in her Daily Feather letter. Buyers also are likely to opt for used vehicles, which cost significantly less than new ones decked out in the latest high-tech features that hike costs (and, for some drivers, are more annoying than helpful). Fed Chairman Jerome Powell declared in an interview aired last week on PBS that interest rates remain “accommodative,” but that policy is headed toward “neutral” and possibly beyond. “But we’re a long way from neutral at this point, probably,” he concluded. It appears the Treasury market is absorbing that realization. That’s surely a negative for stock valuations and, at a minimum, a headwind for the economy. I should not enjoy this, yet I do so, immensely! “Girl With Balloon,” a painting by Banksy, was destroyed Friday at a Sotheby’s auction in London in an apparent prank by the anonymous and mischievous artist. I look forward to QQQ at 185 or higher, soon; ditto for VXX below 26. I see This market is in crashing mode.